Firecrypt Ransomware might cause users some trouble as the malicious application could damage their most valuable data. If you somehow infected your system with this threat, we advise you to consider its removal. The malware’s developers may try to convince users to purchase a decryption tool from them so you could restore damaged files, but despite what they say there are no reassurances they will send the decryptor. There are always reports from users who have been tricked in such situations, and if you do not want to risk losing your money, it might be best to simply get rid of Firecrypt Ransomware. We would suggest erasing it manually as it is shown in the removal instructions added at the end of this page or with a trustworthy antimalware tool. The malware’s title comes from the extension it appends to the damaged data. In other words, as soon as the malicious application encrypts targeted files, they will all have a specific additional extension. For example, an encrypted Microsoft Word document could look like text.docx.firecrypt or document.doc.firecrypt, and so on. As you realize you cannot open such files as they are locked with the AES-256 encryption algorithm. However, if you have copies of damaged data placed on an external hard drive, cloud storage, or anywhere else besides the infected computer, you could swap locked files with copies. Of course, it might be safer to do this only after all possible threats on the system are deleted. 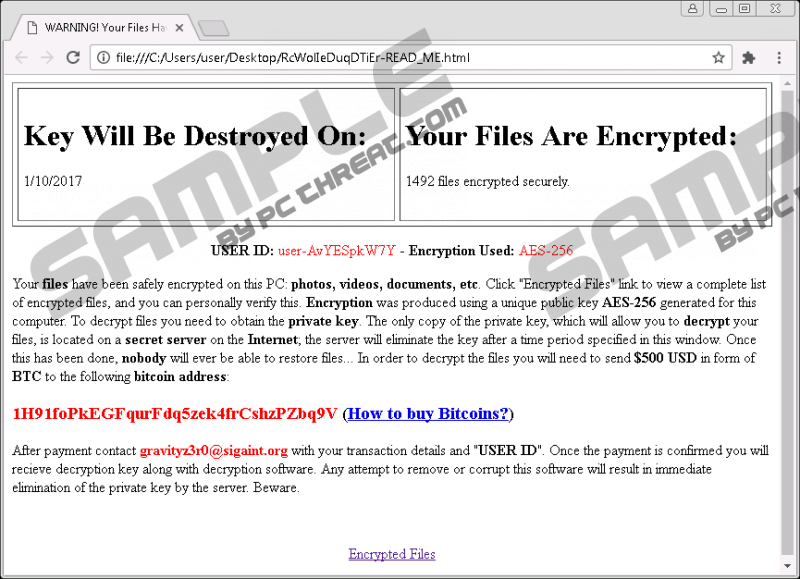 Shortly after Firecrypt Ransomware finishes the encryption process, it should place an HTML file, e.g., it could appear on the user’s Desktop. If executed it should open a ransom note written by the malicious program’s creators. Firstly, it explains what kind of files were locked and how it was done. Then, the text mentions a possibility to obtain the so-called private key. To convince you to purchase it, the note states that “The only copy of the private key, which will allow you to decrypt your files, is located on a secret server on the Internet; the server will eliminate the key after a time period specified in this window.” At this point you should know that it is possible the connection to this server might be lost and if it happens even Firecrypt Ransomware’s creators would be incapable to get the unique key. Also, there is no proof that such key actually exists. The time limit could be given just to give you less time to think and scare you into paying the ransom. What’s more, the ransom note specifies that the requested sum which is $500 must be paid in Bitcoins by sending it to a specific bitcoin address. There is even a link leading to another site where it is explained how to buy Bitcoins. Since the sum is not so small, we advise you not to take any chances, as it will be impossible to get the money you paid back. The malicious application’s developers might forget or refuse to send you the decryption tool for any reason and if it happens there will be nothing you could do about it. Therefore, users have to consider this option carefully. If you choose to get rid of Firecrypt Ransomware instead of funding the infection’s creators, we can offer you the manual deletion instructions available below this article. They will guide users through the removal process step by step, although it could still be too complicated for inexperienced users. Luckily, the malware can be erased while using an antimalware tool as well. All users have to do is to install it on the infected computer and perform a full system scan. Give it some time and the software should detect not only Firecrypt Ransomware but also other threats that could have been installed on the PC over time. Just click the removal button, and the tool will erase all detections for you. If could protect the system from future threats too if you keep it updated. Tap Win+E to open the Explorer. Navigate to the following locations separately: Temporary Files, Desktop, Downloads. Find a malicious file with a random name (you must have launched it before the computer got infected). Select the malicious file and press Shift+Delete. Find the ransom note, select it and tap Shift+Delete. Quick & tested solution for Firecrypt Ransomware removal.